NATIONAL AGRO INDUSTRIAL CO.. LTD.
YOUNG NAM ELECTRIC&TELECOMMUNICATION Co., LTD. Along with the steel, automotive and shipbuilding sectors, the IT industry has served as a locomotive that has driven South Korea’s economy for decades. Internet retailing increased by 7% in current value sales to reach Won33 trillion in 2014. Most of the categories recorded healthy growth rates, in particular, consumer electronics internet retailing which turned to positive growth as overall consumer electronics showed a good performance in 2014. Internet industry is expected to increase by a value CAGR of 6% at constant 2014 prices over the forecast period. With a strong growth rate of mobile internet shopping in South Korea, internet retailing will continue to show healthy growth rates at constant 2014 prices. In addition, Korea’s emphasis on R&D is the main driver that has been bolstering its global competitiveness. Korea has seen the fastest growth in R&D expenditures among OECD countries over the last decade. R&D industry in South Korea will continue to see increasing improvement in the years to come. 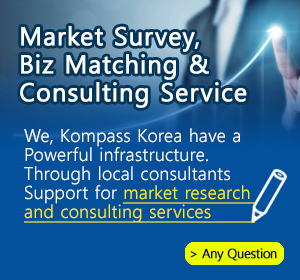 With over 2,000 South Korean companies registered in the Kompass B2B worldwide database, the IT, Internet, R&D sector represents medium activity sectors within our database. This family includes hardware, software, engineering, research, testing services, etc.